The work that is in front of you has aim to contribute for understanding of relations in wide and vivid arena of interest communication. Intension was to bay studious and scientifically based analytical approach, to create a strategicframework of special interest forms of communication, widely known as lobbying. The idea was to get through several units which will represent lobbying as strategic communication and define its usage in modern democratic practice as legal and legitimate activity. Partially relied on certain conclusions from my first book which deals with lobbying subject, “The basics of lobbying”, in work that is in front of you, continues interpretation of the phenomenon with intention to contribute to understanding the logic of the creating framework of lobbying strategy in general, and it wider frame of possible usage. 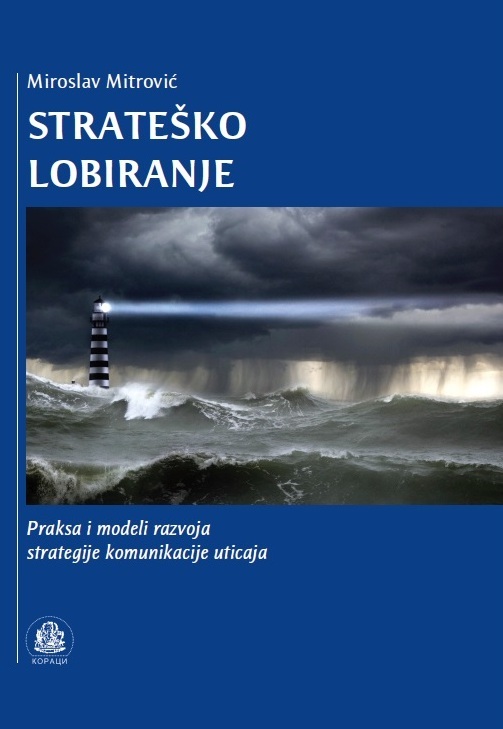 The work is organized in three parts (Strategy, communication, lobbying, Applied lobbying strategy and Lobbying strategy) in which is by relying on theoretic and practical knowledge established and processed logical connection between strategy, strategic communication and lobbying like special form of relation to environment. Namely, the main idea in creating of this work is that concepts of lobbying and strategic planning are getting or got functionally closer. Practically, the set goal is to identify one special sort of communication with strategic model of management, allowing professional, scientifically based and supported by practice creation of future lobbying strategies, and in order to achieve greater efficiency, control of process and reduction of unwanted, illegal and illegitimate forms of action. In first part, Strategy, communication, lobbying, is defined as general concept of strategy, strategic communication and lobbying, with the establishment of interaction and mutual logic of the applicability of all three terms. Second part, applied lobbying strategy, is processing the applied models of lobbying strategies in forms of corporate political action and political lobbying. Here are shown performances by corporations, associations and other forms of interest groups and groups for pressure on process for making decisions, adopting of public policies, elective lobbying and lobbying in foreign policy. Also, forms of organization of interest groups are processed, especially in the USA, their formal legal soundness with display of results, and the strategic framework performance in certain lobbying operations. initiatives or lobbying the international institutions. In the final part of chapter is defined methodology for general strategy of interest communication, named as STAP model. Given model, is very universal, and with application of certain specificities that are related to the certain organization or field of action, could be applied both: in internal lobbying, as well as in phase of preparing of lobbying request according to the professional representative companies.